Nestled on 70 acres of Kaua`i's sunny south coast, this condominium resort delights guests with ocean views, tropical gardens, private pools and tennis courts. Guests will stay in one of five condominium communities, each with its own distinctive style. Each suite evokes the relaxed lifestyle of the Islands. For those wishing to explore, golf, dining and shopping are all nearby. This prime location is adjacent to Brennecke's Beach, Shipwreck Beach and the "Spouting Horn" blowhole. On the South Shore of Kauai Near Brennecke Beach. 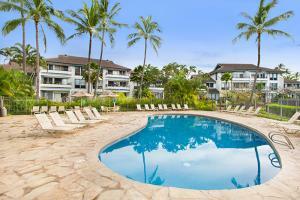 Approximately 25 minutes from Lihue Airport. North Shore, Spouting Horn, Waialeale Crater, Waimea Canyon, Fern Grotto, Na Pali Coast, Helicopter Tours, Deep Sea Fishing, Eco Tours.